Surprise, team Android! 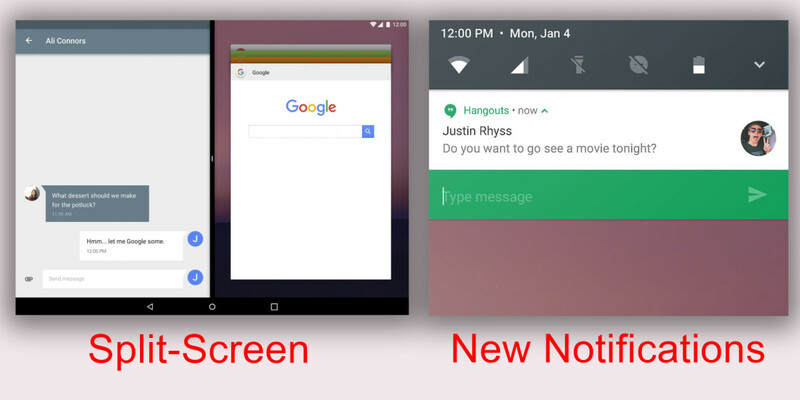 Google’s next operating system, codenamed Android N, is being shown off much earlier than expected thanks to Developer Preview launched today, and it includes a feature stock Android fans have wanted for ages: Split-Screen view. Split screen mode is the most notable change. While this was a hidden feature in Marshmallow, it’s enabled by default in Android N. This will bring a lot of joy to Pixel C users, where the lack of multi-window support was arguably that tablet’s biggest fault. Though it looks similar to third-party implementations, it’s a bit less versatile than Samsung or LG’s approach, which work with most apps out-of-the-box. Google is requiring developers to add in a new app attribute called ‘android:resizableActivity,’ which allows them to dictate details like an app’s minimum dimensions, or whether the app should be resized automatically or redrawn completely with the new size. While forcing developers to opt-in might seem a bit cumbersome – I’ve found Samsung’s nearly-universal implementation works perfectly fine – it has the benefit of standardizing split-screen compatibility and making app-makers think about how they want their apps to look when reshaped for smaller spaces — that will lead to a better experience in the long run. The other big change is to the notification panel, which abandons the Material Design card motif for a more minimal look. Quick settings are now lined up horizontally at the top of your screen (again, much like Samsung or LG), along with a drop down menu for access to more features. The corroborates Android Police’s report about the new notifications panel last month, which also suggested you could edit your quick settings and include several pages to fit in more controls into the panel. The notifications themselves are also more powerful. Developers can now bundle all the notifications from their apps into a single expandable segment, which should hopefully help clear some clutter. You can also now reply directly through notifications, in addition to the standard action buttons. Finally, Google says it’s also improved its ‘Doze’ power-saving feature with Android N. Previously, Doze only worked when your phone was stationary or covered in your pocket by only letting ‘high priority’ notifications ping you. Now the company says it will save battery whenever the screen is off, though we’ll have to see how it works in practice. If you want to give it a try, the preview is available for the Nexus 6P, Nexus 5X, Nexus 6, Pixel C, Nexus 9, Nexus Player and the General Mobile 4G (part of the Android One affordable phone program). Google says we can expect the final version of the OS to roll out to device makers this summer. If you can’t wait that long, you can either sign up for the new Android Beta Program, or download the full images at Google’s Android developer page. As always, be advised that the preview is only meant for developers and advanced users, and that features and design may change significantly between now and the final release. We’ll be downloading and installing the preview ourselves soon to give you a more thorough look onto any potential hidden gems.